A closer look at a common campus sight. Visitors to UChicago’s campus at any time except the coldest months have probably spotted this butterfly, the cabbage white (Pieris rapae). Last summer, visitors may have also seen members of Marcus Kronforst’s lab chasing after them with giant, flowing nets. 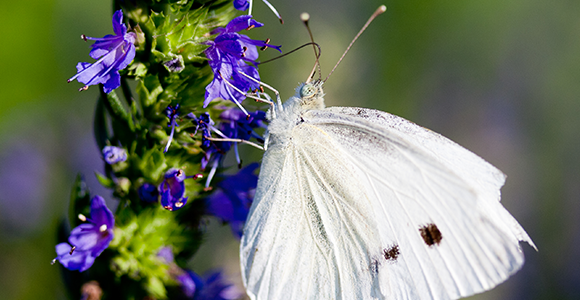 Many of the species studied by Kronforst, a Neubauer Family Assistant Professor, can eat only one type of plant as a caterpillar, but somehow the cabbage white can eat many. The group wants to know why. They collected butterflies from all over the neighborhood, hoping the natural variation within one population might shed light on the genetics of host-plant usage.